A few weeks ago I wrote about my participation in Car Free Day 2009. Some 5,000 cyclists came together for the event. On my way back from the event, my rear wheel punctured a few blocks from home. I didn’t have a spare tube handy and needed to go to the bike shop to buy one. Since I’ve had the bicycle for three years and haven’t yet brought it in for service, I figured I would kill two proverbial birds with one stone. 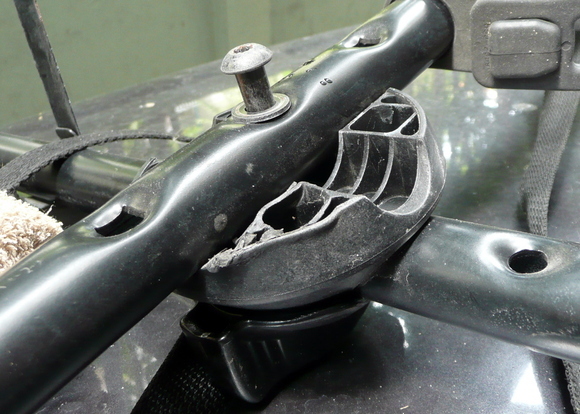 All I had to do was repair the broken parts on my Thule bicycle rack. You may recall that in February, Peter, Stuart and I went for a bike ride in Minburi, east of Krungthep, and our ride unexpectedly doubled in length when the bicycle rack failed on the way home. Tawn drove out in a taxi and took the car and rack home while the three of us rode the extra thirty kilometers back. The rack, made by Swedish manufacturer Thule, is the model shown above. 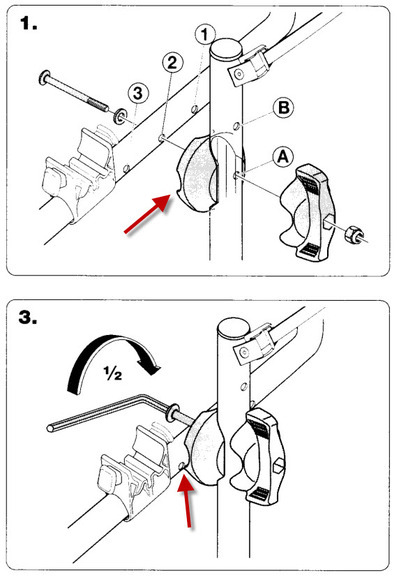 It is adjustable, attaches to the rear of your car, and – according to the picture – can hold three bicycles. In reality, the plastic pieces that hold the metal arms perpendicular bent under the weight of our three bicycles, causing the rack to collapse and the bicycle tires to drag on the road. Here’s a closer view of the schematics showing how the metal arms assemble using this plastic disc to hold them. The arrows indicate the edge that failed. Not wanting to throw out an otherwise usable (and expensive) piece of equipment, I started the process of finding replacement parts. Unable initially to find a local number, I tried the North America customer service number, which connected me with someone in Quebec. He searched for the model number and said it wasn’t in their database. After taking my email address so he could do more research, Thierry responded a few days later that he couldn’t locate any information for that model. Dead end. Asking around at a few local bicycle shops, I learned that Thule actually had a company store in the Central World Plaza mall. Sure enough, it was an emporium of racks. Speaking with the person working there, he confirmed that such a replacement part did exist in the system, but it could take more than four months to receive from Sweden. He told me this in a way that suggested he wasn’t keen to actually order it. That seemed a bit ludicrous. I returned to the Thule website and found an email address for a regional sales manager in SE Asia. After a returned email – “This address not valid.” – I tried the Thule global customer service address. A few days later a response finally arrived. It was the form of a carbon copy of a message to another regional sales manager and the person in charge of the local store, gently admonishing them for making it so difficult for me to get the replacement part. As the regional manager promised, the part was waiting for me four weeks later at the local shop. The cost – about US$ 4.00 per part. The old part still in place. Note the damage in the lower left side. Comparison of the new part, left, and the old part. 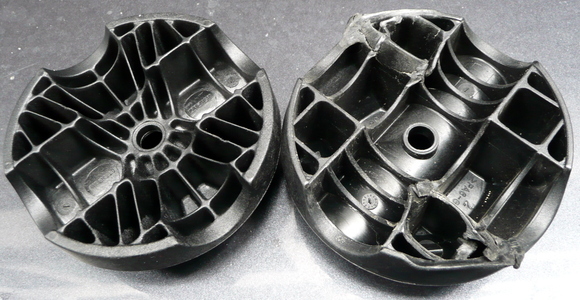 Interesting to notice that they actually changed the structural design of the part. I wonder if this is just a different manufacturing process or a response to a design flaw? Even thought I received the spare parts several months ago, there hadn’t been a need to transport my bicycle anywhere by car since then. Now that I had a need, I finally got myself into gear and ten minutes later had changed the parts. New parts installed, bicycle with flat rear tire loaded up for the drive to the shop. 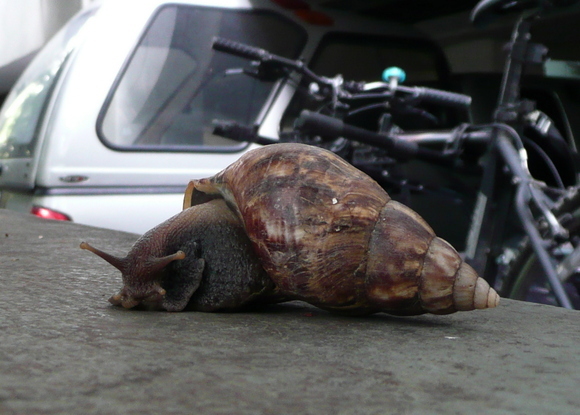 A snail demonstrating the speed at which I would have traveled if I had not had the bicycle rack repaired and had had to walk the bike to the shop instead! $60 later, my bicycle has been cleaned up, tuned up, had the cables, chain, brakes and sprockets replaced, and is ready to ride again. And I have a working rack once more. This entry was posted in Uncategorized and tagged Bicycle, customer service by christao408. Bookmark the permalink. Congratulations for negotiating the maze to find the parts needed. You are either very adroit or just lucky – I can never get that kind of response. 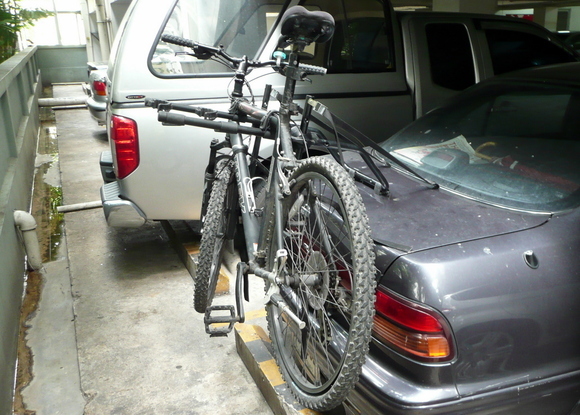 Glad your bike and rack are in working order again – Go Green! I don’t think I really enjoy riding bicycles in SF.Bicyclists have the worst attitude here in the city, even worse than drivers. Glad everything is well again. What a story. It’s so frustrating when companies give you the runaround like that; just to get something done that they should handle in the first place. Looking at the design of the new part, it APPEARS that they realized the structural design flaw and redesigned it. Notice the directionality of the supports, and the increased density, as well as the way the force applied is distributed along so many more supports. The old design just warped because a sheer force was applied to single supports that failed one after another. The old piece looks melted. 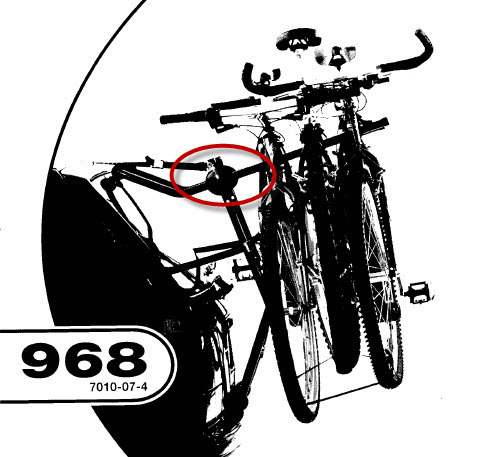 Incidentally, I have a Thule bike rack too, but it’s the cast iron “L-Shaped” one. Haha~Chris, you could have called Curry @ LA and your part will be at you doorstep in a week! There are an abundance of Thule dealers here. What a PITA! At least you got it done. How big is that snail? It looks like a monster snail from the scale of the picture! YAY!!! Is that a Cefiro??? @murisopsis – Lucky, I think. @Wangium – Bicyclists in SF are a bit arrogant sometimes. @chow@ireallylikefood – That was what I was thinking, too. I was almost going to find someone to hand-craft them out of metal for me. @CurryPuffy – Yeah, but I think the model I have isn’t a North America model. That’s why when I called their NA number the person in Quebec couldn’t find it for me. @TheCheshireGrins – The snail that ate Bangkok!!! About four inches head to toe. @yang1815 – Indeed it is. A dirty one that is about 11 years old and needs a wash. The picture of the “giant” escargot startled me. It certainly looks like they’ve added more internal support to that part to carry and perhaps distribute the weight more effectively. @christao408 – And yeah certainly looks like revised design for support.Those Cefiros last for a long time! Too bad we don’t have them anymore in the States. Used to be Infiniti I30. I think you are the only one I know, who can write some heart wrenching episode of your life one day and turn around and write the most mundane thing, and make it look as if I am reading a great novel. I am glad you got your problem solved Chris. The new part looks very good and clean. @yang1815 – Despite a little chipping paint on the outside mirrors (getting hit by motorbikes, etc) the car is still very comfortable and runs beautifully. Don’t see the need to change it for at least a few more years. @ElusiveWords – Something totally different from the theme of bicycles and cycling seemed a nice contrast. @ZSA_MD – Well, the timing is a little deceptive. The coming out story was written a few weeks in advance and had been staged on the site as private posts. All I did was switch them on day by day. The later entries were written with a clear heart since my catharsis in the writing was well past.